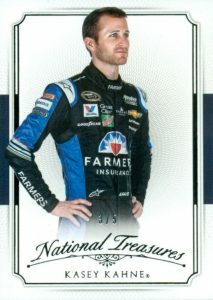 The final racing release of Panini's inaugural season for the sport, 2016 Panini National Treasures NASCAR offers the familiar NT quality to racing fans and collectors. 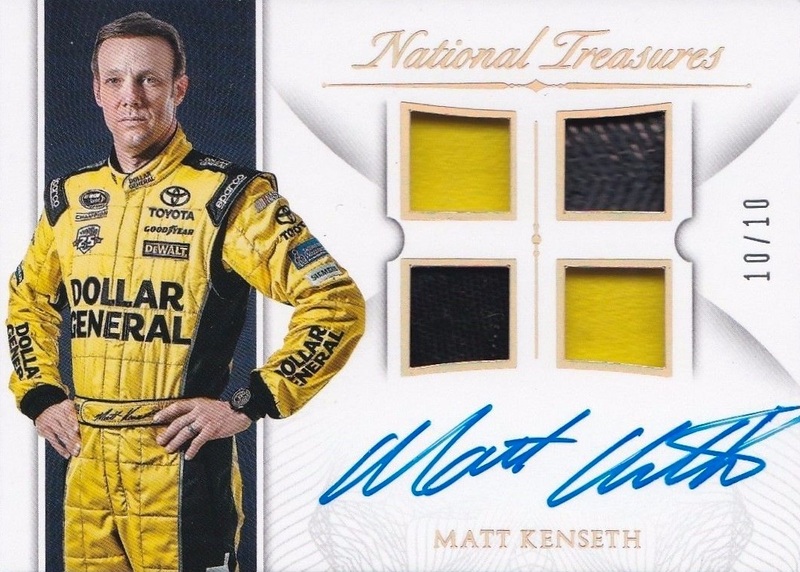 The premium boxes deliver three autographs, two relics and one booklet card. 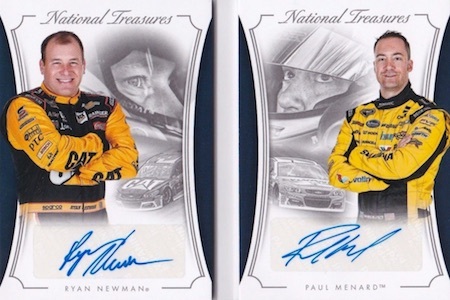 While there is a base set and limited parallels, 2016 Panini National Treasures NASCAR Racing lives primarily through the hits that occupy the bulk of the release. 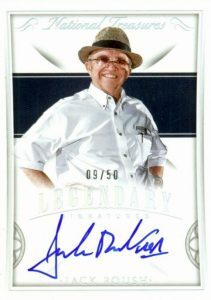 Leading the way are many different signed versions that account for several cards in each box. 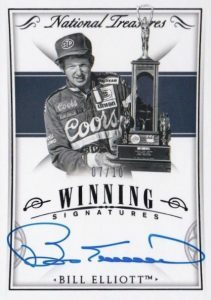 First off, we have the Legendary Signatures for the all-time greats, including first-time signers Mike Helton and Brian France. 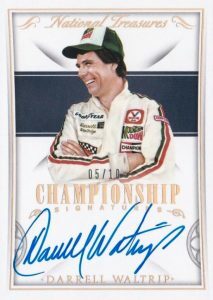 Winning Signatures sticks with the most successful drivers. 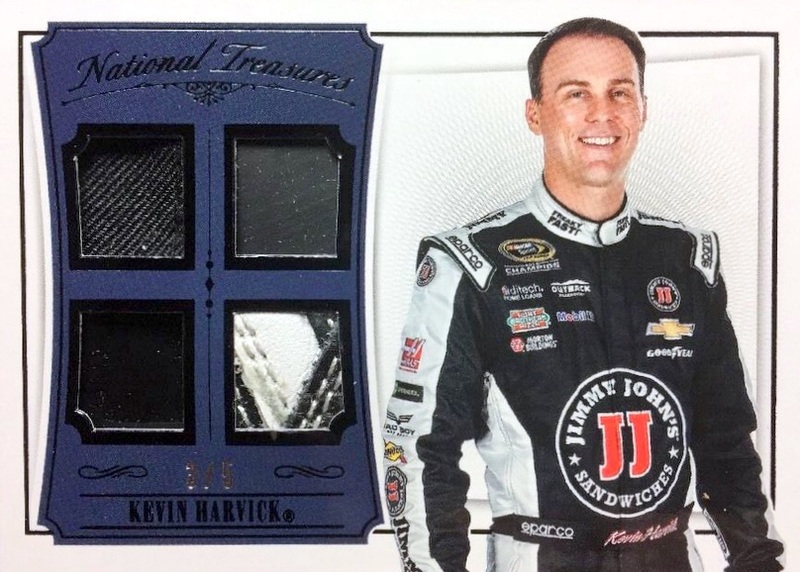 In addition, 2016 Panini National Treasures NASCAR Racing has even more autographed memorabilia inserts to collect. 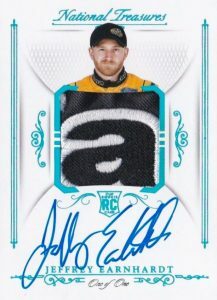 Rookie Signature Materials pairs an autograph and race-used relic for the Sunoco Rookie of the Year. Jumbo Firesuit Signatures offers jumbo swatches while Signature Dual and Quad Materials takes a multi-piece approach that mixes different relics types. 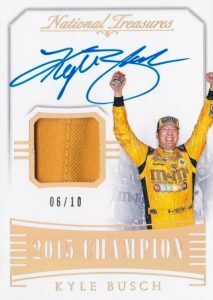 Highlighting the title winners, Championship Signature Threads honors only the champs of the track with an auto-relic insert. 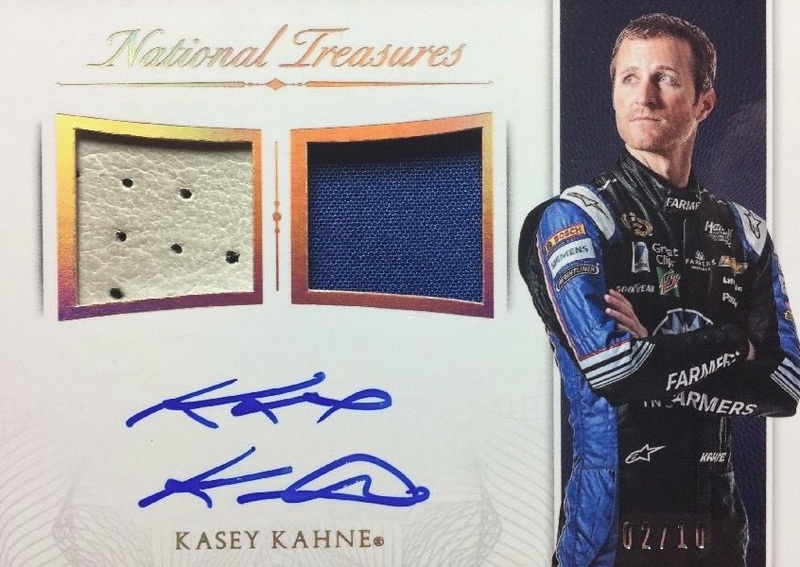 Falling one per box are the various 2016 Panini National Treasures NASCAR Racing booklets which come in several forms. 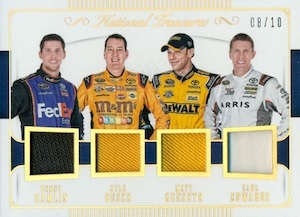 This includes Jumbo Firesuit Patch Signature Booklet cards as well as multi-signed cards with up to 6-8 drivers. 45 cards. Serial Numbered #/25. PARALLEL CARDS: Century Silver #/20, Century Gold #/15, Century Black #/5, Century Blue 1/1, Printing Plates 1/1. PARALLEL CARDS: Silver #/15 (Only card #46), Gold #/10 (Only card #46), Black #/5 (*No card #50), Blue 1/1, Laundry Tags 1/1 (*No card #47), Printing Plates 1/1. PARALLEL CARDS: Silver #/25 or less, Gold #/15, Black #/5, Blue 1/1, Printing Plates 1/1. PARALLEL CARDS: Silver #/15, Gold #/10, Black #/5 (*Card #15 - #/4), Blue 1/1, Printing Plates 1/1 (*No card #4). 11 cards. *Cards found only in parallels noted below. PARALLEL CARDS: Silver #/15, Gold #/10, Black #/5, Blue 1/1, Printing Plates 1/1. 19 cards. *Cards found only in parallels noted below. PARALLEL CARDS: Gold #/49 or less, Black #/25 or less, Blue 1/1. 8 cards. *Cards found only in parallels noted below. PARALLEL CARDS: Gold #/15 (*Card #9 - #/25), Black #/10, Blue 1/1. PARALLEL CARDS: Gold #/10, Black #/5, Blue 1/1. 6 cards. *Cards found only in parallels noted below. PARALLEL CARDS: Silver #/50 or less, Gold #/25 or less, Black #/10 or less, Blue 1/1, Printing Plates 1/1. 2 cards. *Cards found only in parallels noted below. 12 cards. Serial Numbered #/25. *Cards found only in parallels noted below. PARALLEL CARDS: Silver #/15, Gold #/10, Black #/5, Blue 1/1, Laundry Tags 1/1, Printing Plates 1/1. 13 cards. *Cards found only in parallels noted below. PARALLEL CARDS: Silver #/15, Gold #/10 (*Card #25 - #/7), Black #/5 (*Card #24 - #/3), Blue 1/1, Laundry Tags 1/1, Printing Plates 1/1. 29 cards. Serial Numbered 1/1. 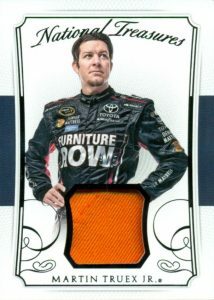 Multiple Associate Sponsor versions exist for each card with up to 20 different options. PARALLEL CARDS: Associate Sponsors (#1-20) 1/1. 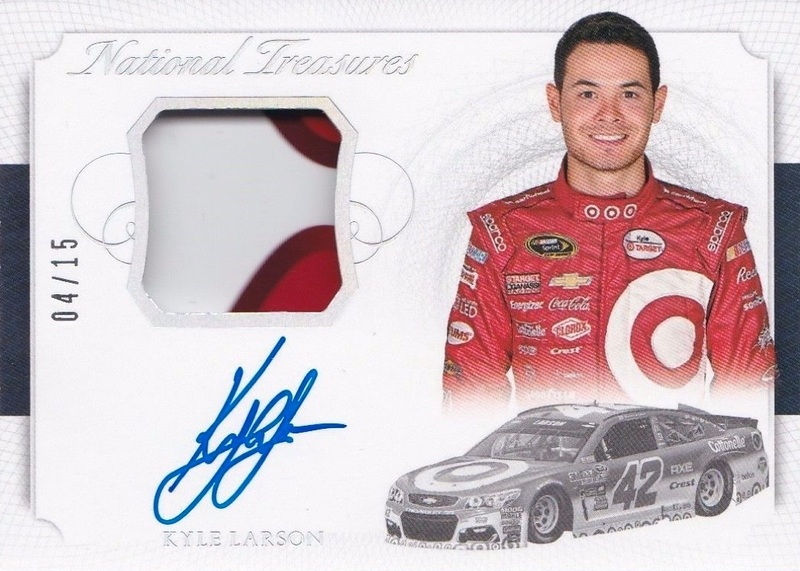 PARALLEL CARDS: Alpine Stars #/4 or less, Nameplate #/2 or less, Goodyear #/2 or less, Flag 1/1, Sprint Cut Logo 1/1, NASCAR 1/1, Sunoco 1/1. PARALLEL CARDS: Silver #/50 or less, Gold #/25 or less, Black #/10 or #/5, Blue 1/1, Printing Plates 1/1. 12 cards. *Cards found only in parallels noted below. 5 cards. Serial Numbered #/25. *Cards found only in parallels noted below. PARALLEL CARDS: Silver #/15, Gold #/10, Black #/5 (*Card #15 - #/4), Blue 1/1, Printing Plates 1/1. 5 cards. *Cards found only in parallels noted below. PARALLEL CARDS: Black #/35 or less, Gold #/25 or less, Blue 1/1. 16 cards. *Cards found only in parallels noted below. 7 cards. *Cards found only in parallels noted below. 3 cards. *Cards found only in parallels noted below. 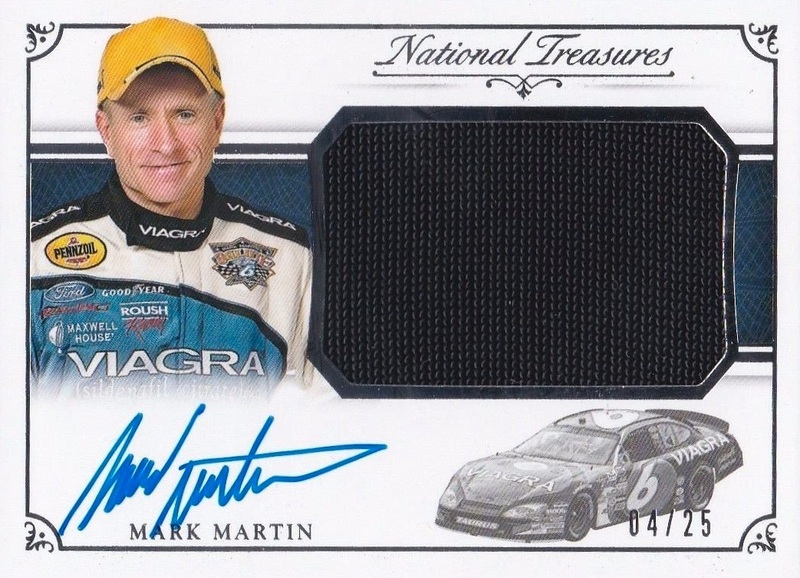 Hi Tom, Martin’s sponsors are listed as: Pfizer, Roush Racing and Ford.